It is the same people giving me methadone, giving me my antiretroviral drugs and telling me to go to my hospital appointments. I do my whole treatment with them. Otherwise, there would be days when I wouldn’t take my pills. In the WHO European Region, the rate of HIV transmission through injecting drug use has remained relatively high and stable between 2010 and 2012. While decreasing in the east, it increased in the centre and west of Europe. 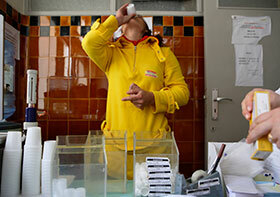 The increase was due mainly to outbreaks in two European Union countries. In September, WHO/Europe will report on progress in implementing the European Action Plan for HIV/AIDS 2012–2015. Each month until then, we highlight a specific area of the Action Plan – this month, reducing HIV transmission from injecting drug use. In 2011, over 713 000 people were receiving opioid substitution therapy in 45 European countries, including 11 300 in the east. Coverage with the therapy was below 5% of people in need in most countries in the east of the Region. Between 2010 and 2012, 6 countries achieved, and a further 11 are now on track to reach, the 2015 European target of a 50% reduction in new HIV infections acquired through injecting drug use; 14 countries reported no substantial reduction in recent years. designating a new WHO Collaborating Centre for Harm Reduction in Lithuania. The 2011 WHO Regional Committee for Europe adopted the European Action Plan for HIV/AIDS 2012–2015 and requested the Regional Director to report on implementation to its 2014 session. The report to the Regional Committee will describe the progress made since 2011 and the remaining challenges.